Andrographis plant, Andrographis paniculate, is also known as King-of-Bitters and Kalmegh. A powerful medicinal herb that boosts the immune system, helping the body defend against current infections and prevent them reoccurring in the future. A bitter tonic of great benefit to the liver. Andrographis plant is native to India and China and prefers moist, well drained soil in partially shaded position. Frost and drought tender. 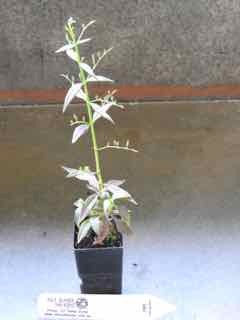 An annual plant, growing to 1m x 0.6 m. Delicate white flowers with purple spots in late summer. Be the first to review “Andrographis, plant” Click here to cancel reply.